Adult Emerald Rockcod (Trematomus bernacchii) surrounded by seastars (Odontaster validus) at Cape Evans, McMurdo Sound, Antarctica. Photo Credit: Rob Robbins, ASC SCUBA Diver In the Southern Ocean surrounding Antarctica there is an extraordinary diversity of marine life. Much of our understanding of the biology of these animals comes from studies of the adaptations of these animals to sub-zero ocean conditions. Research to date on Antarctic fishes has focused on adult life stages with much less research on early life stages that likely prioritize growth and development and not physiological mechanisms of stress tolerance. This project addresses the mechanisms that early life stages (embryos, larvae and juveniles) of Antarctic fishes use to respond to changes in ocean conditions. Specifically, the project will examine energetic trade-offs between key developmental processes in the context of environmental change. A PistenBully sits on the sea ice with Mt. Erebus in the distance. Turtle Rock, Antarctica. Photo by Timothy R. Dwyer. The team will be based out of McMurdo Field Station, Antarctica and will be taking day trips to field sites located on the sea ice around McMurdo Sound. They will access their field sites using a Piston Bully and snow machines. Dr. Anne Todgham is an Associate Professor in the Department of Animal Science at the University of California Davis. Todgham is an environmental physiologist with an interest in understanding the molecular, biochemical and physiological strategies animals use to cope with environmental change. Currently her work has an eye towards global climate change and addresses the general question of whether contemporary marine animals have the physiological flexibility necessary to withstand the unprecedented rates of environmental change. She is particularly interested in how organisms respond to multiple stressors that are predicted to change simultaneously, such as ocean temperature and ocean acidity. Her work is trying to understand how well these fish are at multi-tasking the various demands placed by different stressors. 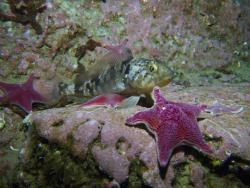 Todgham studies a wide variety of organisms from estuarine as well as temperate and polar marine ecosystems. In the Antarctic, her project is investigating the capacity of early life stages of Antarctic fishes to tolerate projected changes in temperature and CO2 levels and the energetic costs associated with responding to these changes. She earned her B.Sc. in Marine Biology at the University of Guelph, Canada and her Ph.D. in Zoology from the University of British Columbia, Canada. Hi Denise! I like that you talk about feeling like one of your students. I do too! I forget how hard it is to sit for a long period time. Can't wait to follow your expedition! Thank you so much for all of your encouragement. It means the world to me. Thank you! We are learning so much this week, but having lots of fun as we prepare to deploy! Thanks so much! Your experience has been invaluable this week.